The Wild Atlantic Festival Starts this Saturday at 1pm in Ardara car park, where we have the Wexford Theatre Group performing for children. The popular singing star Shane Shovlin will bring the place alive with his open air show on the Diamond at 3pm. Bart Whelan’s photographic exhibition will take place in the heritage centre. The annual blessing of the graves will be held on Sunday at 2.30pm, and then at 4pm there is a film showing in the heritage centre on the life of Packie Manus Byrne who would have been 100 this year. Monday August 7th at 10am, we welcome to Ardara our newly ordained Bishop of Raphoe as he says his first Mass within the diocese at the Church of the Holy Family. We have a wonderful walk leaving the heritage centre at 2pm with Paula Harvey “A sense of our ancestory” and includes a talk on the Owenea Fishery by Conor Whyte. Shane is back for more lively music on the Diamond at 8pm when we have” Dancing at the Crossroads”, Join Clement Gallagher and his wonderful dancers for an evening of fun on the Diamond. This is followed by a great country dance in town. Tuesday we welcome everyone to visit our weavers at any of the factory outlets in Ardara. This is a visit well worth making and you will be so welcome. At 3pm we have music on the Diamond, and then at 6pm Paula Mc Mullin welcomes all to the fabulous “Green Gate”. This promises to be a lovely evening, and Paula will show you around the lovely gardens and grounds of this wonderful setting and, with her usual kind hospitality, makes you welcome with a cup of tea and scone. Every night in Ardara there is great music in town. 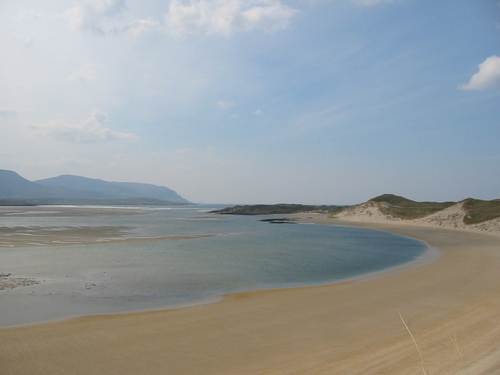 Wednesday we are on tour of Donegal with a mystery trip to a beauty spot in the county. At midday in the heritage centre, there will be a film screened, for aprox 25 mins on Donegal and its beauty, and these film events are free. The Bart Whelan photographic exhibition is on all week in the heritage centre. Thursday we have a lovely walk at midday around the town taking in Kentucky, Bogroad ,Woodhill and Magumna about one hour starts at Catholic Church. More street music with Shane at 3pm. At 4pm Bart Whelan will give at talk in the heritage centre on his great new collection of photos that he has on display this year. Friday at midday the film on the beauty of Donegal takes place at the heritage centre. At St. Shanaghan’s House at 2pm everyone is welcome to the house to meet the residents, have tea and see the wonderful display of arts and crafts made there by the residents and friends. Stephen Bennett, our greatest artist, welcomes everyone all the time to his studio at Carn but at 4pm on Friday there is a special welcome and special discounts available. The Loughros Point Rowing Club have their annual Duck Race in the Owentucker River at 7pm. You could view it from the town bridge. Please support this great club. Saturday August 12 is Show Day in Ardara always a special day in the life of Ardara and this year Geraldine has a coffee morning at the Flower Pot at midday come along and support a worthy local charity. The Wild Atlantic Festival 2017. The Wexford Theatre Company is the resident professional company at the newly refurbished Athenaeum Theatre in Enniscorty .The group are presently touring the country and are in Ardara on Saturday August 5 this year. They have a very exciting new show for children ,”Jeff and Elvis”this is a wonderful celebration of storytelling. This exciting production, packed full of adventure and fun,uses songs, puppets, masks and comedy to tell the story of how an old bully changes his ways and finds happiness through love and friendship. Show times in Ardara are 1pm, 1.45pm and 2.30pm in the marquee in the carpark .Wonderful show for all children, and admission 2 euros. The editorial board of Duchas are busy with entries to this year”s edition. If you have a story or an event of special significance in your life why, not send to Layoutduchas@gmail.com .The deadline comes quicker than you think so get writing now. We need stories to be around 1500 words if possible.